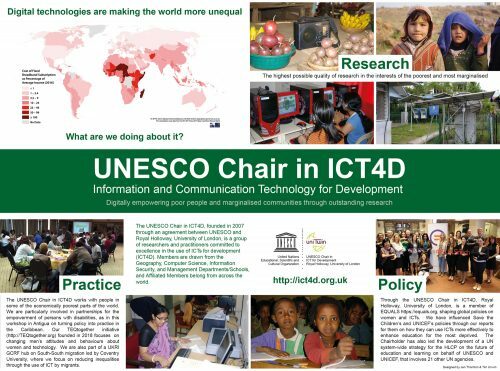 Members and Affiliated Members of the UNESCO Chair in ICT4D conduct a very wide range of research and publish on many aspects of ICT4D, particularly seeking to serve the interests of the poorest and most marginalised. Details of some of our main areas of research are listed below. These also provide an overview of the Chair’s areas of consultancy expertise. Although some members are highly critical of the Sustainable Development Goals (SDGs) project, this list also shows how the UNESCO Chair in ICT4D effectively undertakes research on most of the SDGs. Do follow the links to individual members of the Chair for further information about their research, or to contact them with respect to consultancy requests. Cashless India: A new digital divide?